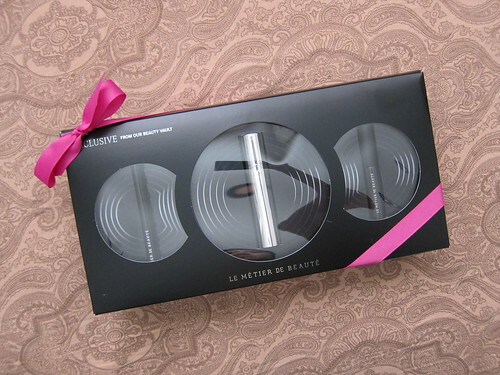 To kick off my birthday month, I am giving away one (1) box of Le Metier de Beaute’s Beauty Vault. It was released for Nordstrom’s Anniversary Sale this year and is no longer available for purchase. This limited edition set includes a full size Noir Precision Liquid Liner, travel size Peau Vierge Tinted Luminizer in Shade 02 Light/Medium and travel size Anamorphic Lash Mascara in Black. An exclusive first look into Le Métier de Beauté’s beauty vault! Out from under lock-and-key, a luxury trio for skin that glows and eyes that shine. The perfect product ensemble to complete your flawless, long-wearing look. Follow me on Twitter, username is nuts4pilinuts. Anybody of legal age is welcome to join, friends, family, twitter-buddies, friends of friends, etc. This giveaway will end on Sunday, November 11, 2012 at 11:59pm PST. Winner will be announced on Twitter, Facebook and here on the blog at the upper left corner of the widget area. Awesome giveaway! Thanks so much!!! I wanted this during the sale and never got around to getting it. Emilie…I follow you on Twitter & Tweeted!!! Thanks for hosting…the beauty items look fantastic!